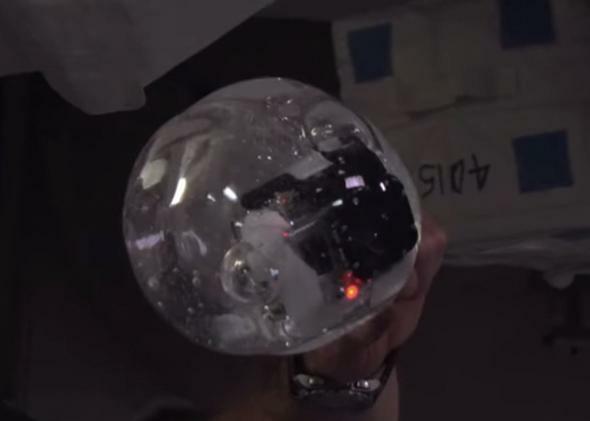 Astronauts on the International Space Station play with balls of water in microgravity. Astronauts Play With Blobs of Water in Zero Gravity. Yes. This is just the best idea. Astronauts on the International Space Station have had so much training that once they’re up there, they probably get pretty used to the conditions. But no one could be jaded enough to be bored by the crazy physics of microgravity, right? Right. So NASA astronauts Steve Swanson and Reid Wiseman, and European Space Agency astronaut Alexander Gerst, made the video that we would all want to make if we were up there. They explored water’s surface tension in microgravity. That is to say, they messed around with balls of floating water. And then, because they are geniuses, they stuck a waterproof GoPro inside one to get a water’s-eye view. And since NASA has been working on a project to shoot space in 3-D, the astronauts used one of the 3-D cameras to film the whole water blob thing, too. If you have some red-blue stereoscopic 3-D glasses handy—who doesn’t?—you can watch that version here. Now that David Bowie gave permission for Chris Hadfield’s version of Space Oddity to go back on YouTube, the astronauts-doing-awesome-stuff video genre is back on top.